In 1983, the first Bandit was created. The company now has manufacturing facilities that exceed 240,000 square feet, based at Millbrook and North Winn, Central Michigan. 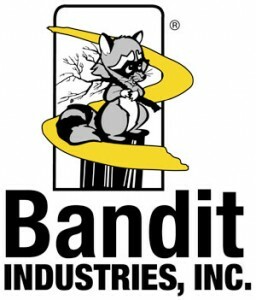 Bandit Industries is now a full-line manufacturer producing a range of over 35 unique Chippers, Stump Grinders and Waste Reduction Units. The Bandit stump grinder machines have been designed to maximize productivity. Each stump grinder features unique user friendly features that will make all your stump grinding needs an easy and effortless task. All Bandit stump grinders are built with the highest quality and use the best components reducing maintenance costs. The access widths of the Bandit stump grinders are 29" to 82". Model HB19XP - Manual or Self-Propelled Stump Grinder - Kohler 27-horsepower gas engine. Model HB20XP - Self-Propelled Handle-Bar Stump Grinder - Kohler 27-horsepower gas engine. Kohler	CH740S - 27 Gasoline engine. Kohler	CH930S - 38 Gasoline engine. Briggs & Stratton - 35 Gasoline engine. Caterpillar - 34 horsepower engine. Kubota	V1505 - 35.1 Diesel engine. Model 2450XP - Self-Propelled Stump Grinder - turbocharged Kubota 44.2 horsepower engine. Model 2890XP - Self-Propelled Stump Grinder - Kubota 84.5 or Caterpillar 114-horsepower engine. Model 3200XP - (towable) Towable Stump Grinder - The Deutz 79-horsepower engine. Model 2900XP - Track Stump Grinder - Kubota 84.5 horsepower engine. Model 3200XP - Track Stump Grinder - Deutz 79-horsepower engine. Model 3400XP - Track Stump Grinder - John Deere engine.